The Third Doctor serial ‘Planet of the Daleks’ is hardly regarded as a classic, and it doesn’t instantly spring to mind as one of the tales most deserving of revisiting. 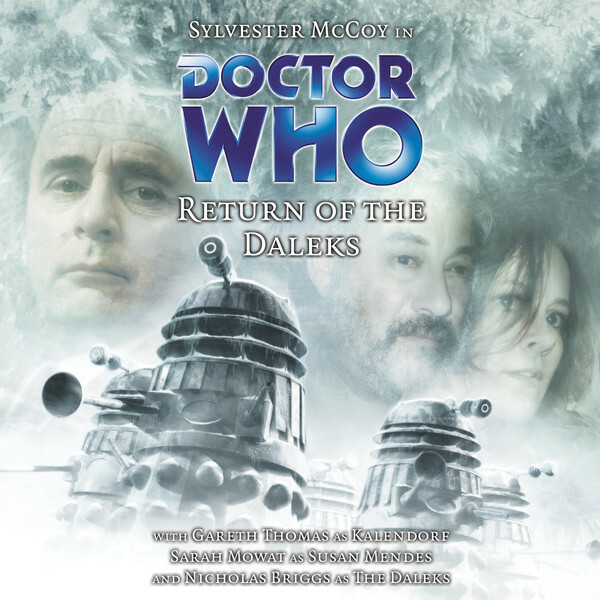 However, as Nicholas Briggs takes over for Gary Russell in the role of producer and also takes on scripting duties for 2007’s Bonus Release ‘Return of the Daleks,’ he manages to seamlessly incorporate the more intriguing elements of that story into the expansive mythology of Big Finish’s own Dalek Empire series to great effect. It’s actually rather surprising that there has not been a story seeing the Daleks returning to Spiridon to reclaim their frozen army to this point, but now that they have once more arrived, Briggs also manages to integrate the light wave sickness that the planet’s natives’ natural state of invisibility causes them. While the Daleks’ motives here tie directly into Dalek Empire, the potential of the ensuing Dalek might also draws the attention and ire of the Seventh Doctor, here traveling alone but just as mysterious and enigmatic as ever as he tempts Karlendorf with secrets and snippets of the true reality around them. Even if it seemed odd to have such grandiose Dalek schemes take form in Dalek Empire without drawing the attention of the Doctor, ‘Return of the Daleks’ reveals that he has, indeed, been fighting on behalf of humanity in a smaller and more shrouded context while still allowing the humans to defend themselves and earn their right for survival. As always, though, the Doctor becomes the Daleks’ prime focus once they realize his presence, a fact that works both as a positive and negative for the release as a whole. Importantly, ‘Return of the Daleks’ serves as an entry point for anyone who has not listened to Big Finish’s epic Dalek Empire, and plenty of time is given to introduce both Susan Mendez, who acts as the Daleks’ Angel of Mercy to keep morale high across the realms of Dalek subjugation, and Karlendorf, a one-time Knight of Velyshaa who reminds Susan of her true puppet status while also planting thoughts in the minds of the people on the worlds to which they travel in the Daleks’ name. Yet the Doctor overshadows both once he realizes what is truly occurring and that he has to actively interfere to keep the timeline on track and to keep Karlendorf alive to play his ultimate role. The Doctor often makes personal sacrifices in order to make the situation around him better, but his perceived penance for not effectively eliminating the Dalek threat when he originally had the chance is much more meaningful and profound than in most instances and effectively brands him a traitor in the process. Playing a very long game, the Doctor must work for the Daleks for years under the guise of giving them the power of invisibility, keeping them appeased and occupied until Susan and Karlendorf can finally bring down the mighty empire. The resolution is unfortunately quite rushed with little time to explore the impact of the Doctor’s actions, but McCoy is superb from beginning to end, first as a lonely godlike wanderer and later as he imbues an intense menace to his character who seems to revel in the Daleks’ despair. ‘Return of the Daleks’ isn’t necessarily a story can stand completely by itself and quite happily includes a bevy of continuity to satisfy long-term fans of both the television and audio formats. However, with its grand ideas on display and its ability to turn the Dalek Empire saga into a Doctor Who story, it certainly is a story that makes the most of its hero, its foes, and its prominent guest stars.